Spotify is some of the best money that we spend every month. It’s awesome to have easy access to “all” the music. A while back, I clicked the button in the app to keep a history of all the songs that I listen to on my Last.fm account. Now that i’ve been using this for a couple months, it’s fun to see my listening trends. You can actually view my profile too, but here are some of the stats I picked up. 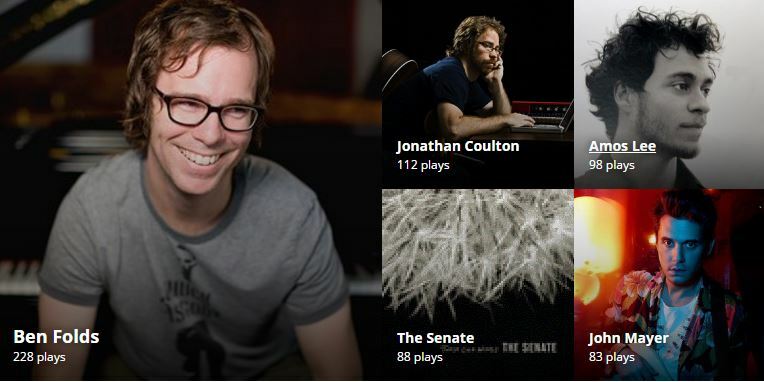 Jonathan Coulton – Best. Concert. Ever. I don’t quite understand how they do these calculations. For example, if I’ve listened to the “Live at Solstice” album 40+ times, why aren’t those tracks in my “top tracks” list? But regardless, I can wholeheartedly recommend all of that music. It’s a pretty good cross section of what I listen to at work. I don’t have that feature enabled when I play music at home or on my phone since then I would be flooded with Elijah’s music.